Who did the Voice of Mister Ed the Talking Horse on the American TV Show Mister Ed? 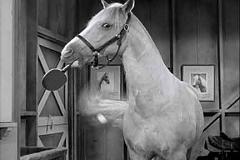 Mister Ed was an American television sit-com that first aired on January 5, 1961 and ended on February 6, 1966 on CBS. The stars of the show were Mister Ed, an intelligent horse who could talk, and his owner, an eccentric and klutzy architect named Wilbur Post. Mister Ed’s real name was Bamboo Harvester, and he was the horse of course. His voice was not his own, mind you, but one provided by actor Allan “Rocky” Lane. The show was inspired by short stories by Walter R. Brooks, including Ed Takes the Pledge. The concept of the show was similar to Francis the Talking Mule, who was the first talking equine on screen. The equine talked only to one person, Wilbur, which both helped and frustrated its owner. Hollywood rumor has it that the mule who played the role of Francis was trained in part by cowboy-philosopher Will Rogers. The voice was done first by Chill Wills and then Paul Frees, in the last movie. Although Francis was supposed to be a boy, the real mule was played by a girl mule named Molly. What does “Best in Show” Mean When Referring to a Dog Show? What Was the Trojan Horse In Greek Mythology and How Did Odysseus Use the Trojan Horse To Defeat Troy?